Chios: one of Greece's hidden gems, bristling with history, character and romantic seascapes. The fifth-largest Greek island, Chios is situated in the Aegean Sea, a stone’s throw from Turkey. Famously nicknamed “the Mastic Island” for its major export of mastic gum, Chios is an often-overlooked destination. This lesser-known isle radiates history, culture and beautiful beaches. Popular attractions include the villages of Pyrgi and Olympi, and Chios Castle. 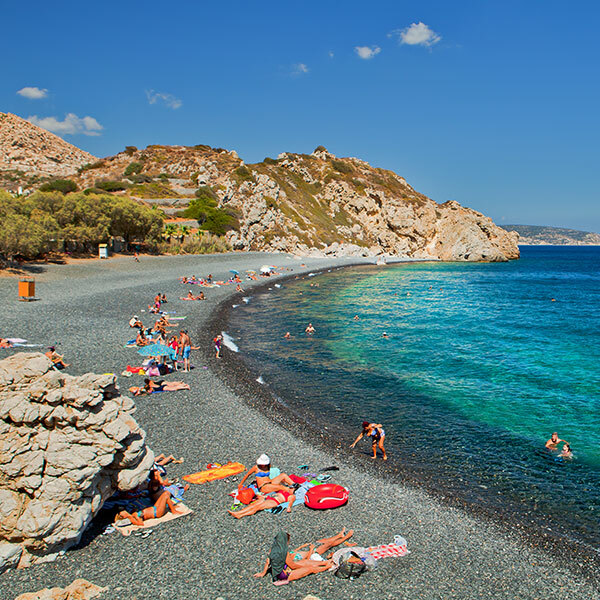 Get lost in the magic and charm of this Greek island with cheap flights to Chios! The island is served by Chios Island National Airport (JKH), situated on the east coast of the island, just 10 minutes from the city centre. The architecture and designs dominating the villages will leave you curious and inspired. 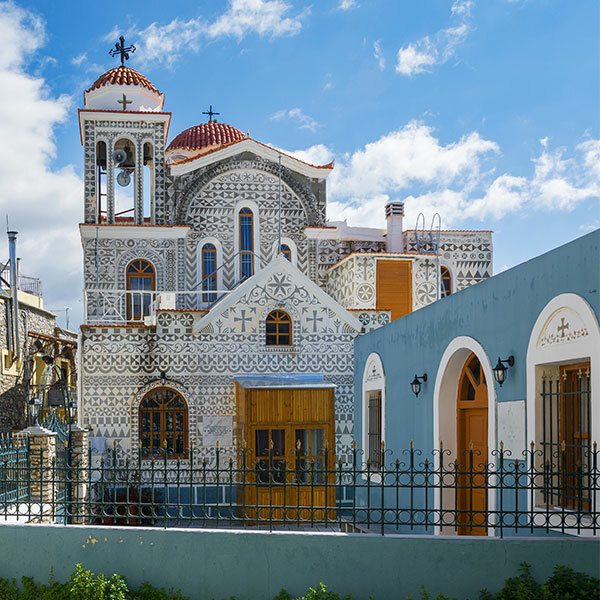 From intricate geometric figures to heavy stone-clad arches and domed fortresses, Chios is any architect’s dream! Wander through hidden alleyways, eerie caves, curious spaces and seaside boardwalks of Chios’ villages. Ancient castles sitting atop stretching coastlines provide the perfect backdrop to modern living set amid medieval history. Gorgeous beaches fringe the coastline of the entire island. No matter which part of the island you find yourself in, you’ll be treated to incredible sunsets, sparkling blue ocean, and sun-tanning opportunities aplenty! Chios’ peak season is in summer (from June to August) and you can expect to pay more for flights and accommodation during this time. With no rain and warm temperatures averaging 30 °C, this is a great time to visit if you don’t mind the crowds. Summer is also prime time for festivals, when the streets come alive with traditional music, dancing and local feasts. Spring (March-May) is a good alternative, with slightly fewer visitors and a vibrant buzz around the island. For a more budget-friendly holiday on the island of Chios, consider visiting during autumn, between September and November. 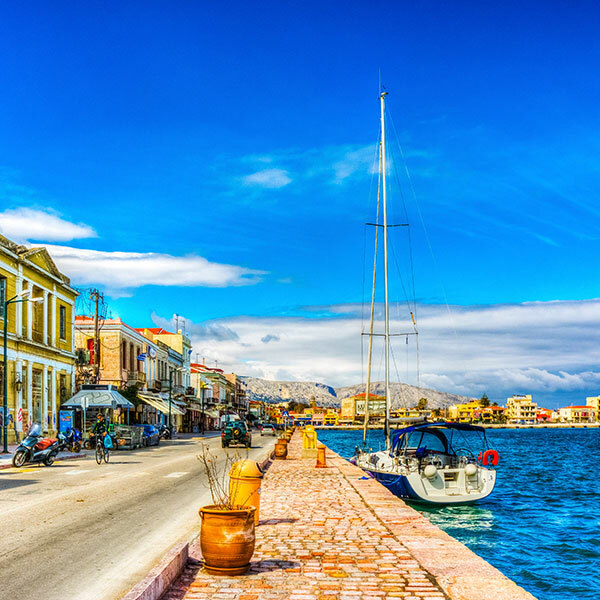 With daytime temperatures averaging a comfortable 22 °C, very little rain and hardly any tourists in sight, this might just be the best time to visit Chios! Chios is a hidden treasure amid the Greek islands. This island is characterised by its medieval villages, Byzantine architecture, picturesque beaches and al fresco culture. Its charm and character permeate everything you see, and you cannot help but be drawn in and captivated by its compelling beauty. A walk through its villages will take you back to a time of revolutionary battles and medieval character. You can easily spend hours walking through the stone-clad streets of Pyrgi, Olympi and Mesta – small medieval villages bursting with unique architecture, geometric paintings, cute cafés and colourful balconies. The imposing archways and narrow alleyways give way to hidden taverns, bakeries and courtyards. The central town bristles with modern living set against a backdrop of ancient ruins, castles and neoclassical architecture, paying homage to its Arabic influences. Those in search of sun, sea and sand will not be disappointed in the sheer beauty of the island’s turquoise ocean lapping against black sand beaches. For the perfect sunset, head down to Mavros Gialos beach. Karfas beach is a hub of activity and water sports, while Agia Fotini is a popular spot for sun-tanning and feasting on the local seafood. Those interested in the island’s history and architecture can visit the Nea Moni monastery and Maritime Museum in the centre of town, and the ornate Megalos Taksiarhis church in Mesta. If the architecture, rugged landscapes, and beaches aren’t enough – there is always the food! Feast on Mediterranean delicacies and Greek specialties, including the freshest seafood. Accessible by both ferry and airplane, a 45-minute flight from Athens will soon see you touching down on this stunning island. Compare several airlines and book your cheap flights to Chios online at Travelstart! Chios is a wonderful island to explore both by day and night. You can feel safe walking the streets, whether alone or in a group. While there has been a recent influx of refugees to Chios (due to its close proximity to Turkey), they don’t present any real danger to the island and the locals and government continue to extend a helping hand wherever they can. The healthcare on the island is very good, with public and private hospitals available. Be aware that tap water is not safe to drink, so stick to bottled water instead. As with all travel, a comprehensive travel-insurance policy to cover theft and medical expenses is highly recommended.